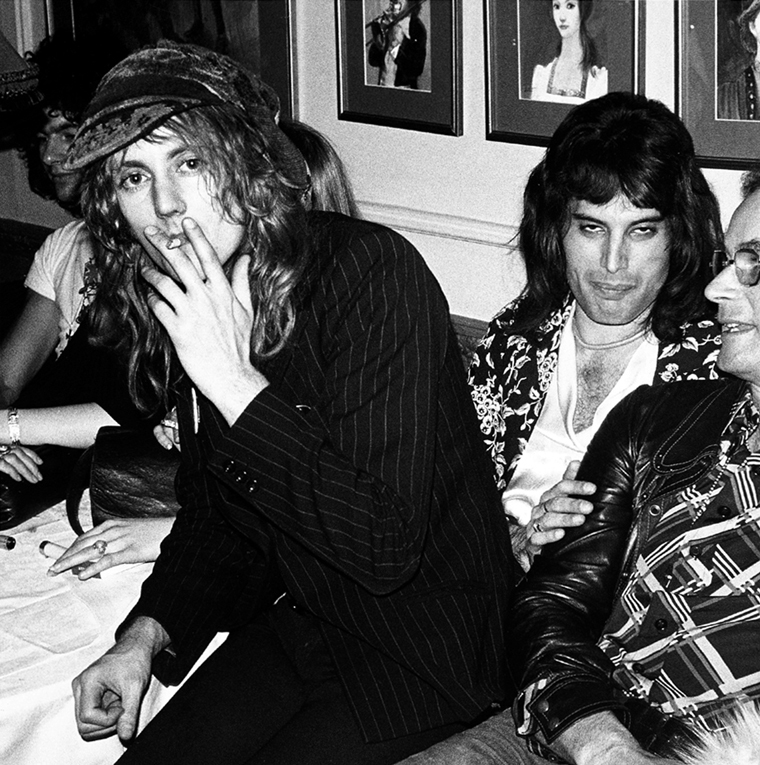 "It was for the launch of Sheer Heart Attack. You know I did a few album covers for Queen back in those days, and a whole bunch of pictures. And they were obviously having a good time. It was in 1974 in London. I would shoot parties back then, but parties for the people I was working with already that I was already friendly with. I mean I’m too much of a big girl to be a paparazzi, I only ever took photos of people that wanted me to take their photographs, and clearly they’re quite happy, and they were comfortable having me around. I’m a wide-eyed young man, and I’m romping along, and I’m atop all these characters, and I’m right in the thick of it, and the only photographer in the thick of it, I mean unlike today when if anything looks a little bit interesting you get 50 people taking photographs of it. Back then I was the only photographer around in that particular scene. There weren’t that many rock photographers generally, and normally they were directly affiliated to a publication, but I was like a free radical just floating around. I had gotten to know these people, and I had gotten a certain cachet for my association with David [Bowie] and Syd Barrett. "Oh well Bryan’s really drunk, and you can see the waitress is poised at the side. That was taken at Biba’s. Biba’s for a while—there was a lady called Barbara Hulanicki and her husband floating around London with their little shop, and they took over this great department store that had closed down—but right at the top they would have something that they called The Rainbow Room—I mean there have been other Rainbow Rooms, I know, including in New York—but that was The Rainbow Room, and right at the top of the building they would have these great parties, and people played there too, The [New York] Dolls, The Pointer Sisters, Screaming Lord Sutch, Albert King... they would have all these great performers, and all the fashionable people of that glammy London scene would show up including Bryan Ferry and Amanda Lear. “I’m in London at a place called Blakes Hotel where Lou used to stay when he came to London in those days, and she happened to be in town, and [John] Cale happen to be in town. Lou and I had been trying to get all three together to photograph them, and this was like ’75, and they hadn’t played together for several years. 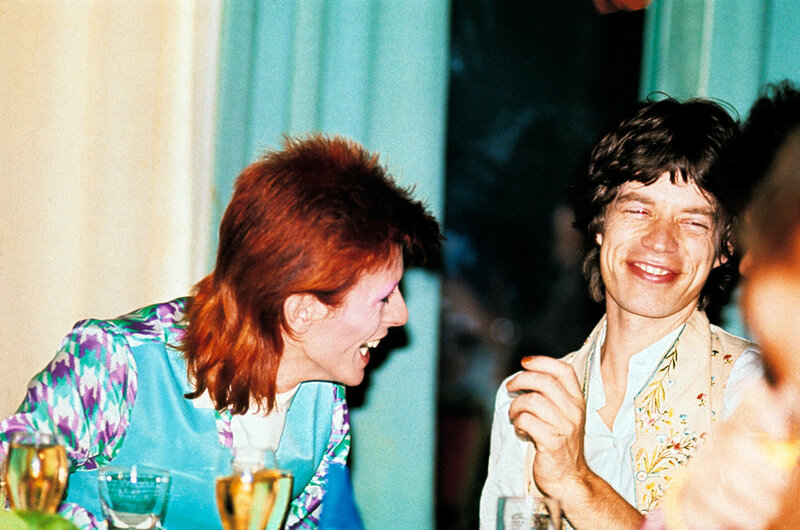 Anyway I did shoot Lou with Cale a little bit earlier that evening, and then three of us, Lou, me, and Nico hung out at Blakes Hotel. And I took a ton of pictures of them which I love, and you can see she’s a little bit past her visual prime, and she was no longer blonde. Well I think she had been hammering it a little bit you know, in terms of this and that, but they were obviously very close. I mean they had had their affair, and of course they were forever associated through that first Velvet [Underground] record and with the Warhol cover.